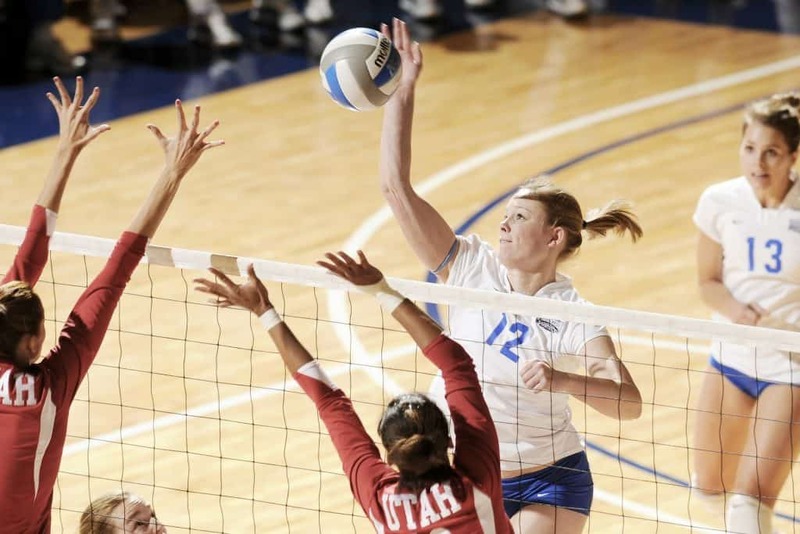 ​When it comes to learning how to block in volleyball, there are a few different key factors you need to learn. Then, use them to work together. Learn the right footwork to help you gain momentum for the jump and how to curve your body away from the net as you block. Know how to time your jump to match the other players. Finally, work together with other blockers to be successful. ​When it comes to footwork at the net, you really want to keep it to a few concise steps. That way your players aren’t tripping or taking too many steps to get where they need to be. When you are practicing volleyball blocking drills, remind the players to remain close to the net so they don’t miss an opportunity to block. This also doesn’t leave any shuffling room to go backwards or forwards. Also make sure your players are wearing appropriate training clothes to aid them in these drills, as they will be need to be as quick and as agile as possible. These footwork focused drills will help them learn the best way to move laterally across the net. 1Have your players get into two single file lines on the outside hitter spot by the ten foot line. 2One at a time they will run towards the net perform a basic jump. 3Then you will have them do the three step or two step crossover blocking footwork to move to the middle position. 4As the first person moves to go to the middle, the next person in line will run forward and try to time their jump with the person going to the middle. 5Players will block at the outside position, middle position and left side position before they go to the other side of the net and file into line there to go back across. Have the players run through this basic footwork drill a few times. Since it is very simple, it could work for beginner volleyball players, but just make sure you tweak it to their skill level as we proceed. Make sure they are not standing up straight at any time during this drill. They should have knees bent, elbows at a 45 degree angle while approaching and moving against the net. When it comes to moving laterally like this, make sure the players are wearing high traction volleyball shoes for blocking and running. These will help grip the floor without slipping when they take these big and fast steps. ​The three step block is a more controlled blocking footwork choice. This is because it gives players time to step, gather their feet, and then jump at the net for the block. 1Have your players take the first step with their right foot. 2Follow up with a crossover big step from their left foot. 3Bring their right foot together with the left and then jump in the air. 4Square up their body to the net as they begin to jump. 5Land with their feet together. This three step approach lets players build momentum before the jump. Their final right footed step becomes the trigger step to use all of momentum to propel them high in the air. ​The cross over step is a great choice when players have ground to cover quickly. This simple two step move helps them get to their spot quickly while providing an excellent momentum to get them in the air. 1Start your players with their feet together at the net. 2Take a first quick small step with the right foot. 3Next, have them swing their left foot around and take a giant running step towards the right. 4Continuing the momentum with the left step, jump as their right foot is lifted. 5In the air, square your body up to the net. 6Come down on both feet, squared up to the net. To move to the left, you will switch the instructions for your players. Have them start with the left foot and then cross over with the right. ​When it comes to jumping at the net there are a few things you need to know and put into action. As a blocker, you need to make sure you are extending over the top of the net. One of the most common mistakes that happens during blocking is that the blocker is not far enough over the net. When the ball is blocked, it ends up on the blocker’s side of the net and rolls down their body to the floor. To combat this common issue, blockers need to do a pike jump at the net. A pike jump is one where your body bends forward at an angle so that your legs and arms are moving forward. When it is done correctly, your body will make a slight ‘C’ shape. This jump happens mostly at your core, so you will need to start incorporating more core building exercises. The most important thing to also remember while blocking is to stay off the net. Touching or bumping into the net is a violation and you will give the other team a point. This is why the pike jump is a must, it keeps your torso away from the net while your arms and hands are able to extend up and over the net for a block. ​Now that you know how to move your feet to get to your spot for blocking, you now need to figure out how to time your jump. This can be one of the hardest parts of blocking due to figuring out when you should jump. The main thing to know about your timing is that you need to watch the person jumping, not the ball. You also want to watch the setter to see where they will send the ball so that you can put your footwork to good use, getting to where you need to be. The best way to practice your timing is to alternate blockers in during hitting drills. This will help them learn how to time a hit in a game situation. And when they are learning the timing, it isn’t something they can always get right away. It will take practice, so it is a good idea to fit in some small blocking drills as you are running other drills such as a simple spiking drill. ​Adding a blocking element to the spiking drill is an excellent way to utilize many elements of offense and defense. These help advance your players and get them ready for in game situations. 1Line up your players in a standard spiking drill formation. 2Have one to two blockers on the opposite side of the net. 3As the offensive player goes to spike, have your blockers do the footwork to get to them and then time their jump. You can choose to rotate all of your players in for block practice or opt to focus on specific players who will be on the front row blocking. This addition to the spiking drill also will put some pressure on your players who are spiking. They won’t have that easy spike over the net. Instead, they will have to learn to adjust to a blocker and find the better hit to get around or over them. The most important thing to teach your blockers is that they are blocking the player, not the ball. If they focus on blocking the ball, then they will not be as successful. However, if they watch the spiker and square up shoulder to shoulder with them on the net, then they have a better overall success rate for blocking the ball. ​This move is going to require a lot of coordination and strength to pull it off, but in time your players will get a hang of it too. ​This is a simple and quick drill to practice with your players to help them learn how to move to the target and jump as the ball is spiked. 1Have players line up behind the ten foot line in the middle of the court. 2Coaches will stand on a chair or platform to lob spikes over the net. 3Have the first single blocker move forward to the middle position of the net. 4Slap the ball to signal the set happening. 5The player will then use their footwork to get there and block as the coach lobs or spikes the ball over the net. This drill will help players learn how to get there and time their jump with momentum so they can perform a good block. Also make sure that they are squaring their shoulder up to the coach as they are in the air. ​Volleyball is not a single person game. You need a team to be successful and you need to know how to work together on and off the net to create great plays. When it comes to working together on the net, the three front row players will all be at the net, ready for the block while the opposite team has the ball in play. Once the setter takes command of the ball, that is when the three front row players will begin to move. The middle hitter will almost always be involved in a block, since they can move to either the right or left to help with a block. The two outside hitters must alternate between being up at the net for a block. If the ball is being spiked from the opposite side, then this player not close to the block needs to back up off of the net and get into a ready position off to the side behind the two blockers. In this position, the extra player is able to dig any balls that are not fully blocked or fall to the side. The setter will also provide back-up coverage behind the blockers. ​Line up your players on the court to walk through this drill. Have your players go into a basic defense position while the coach is on the opposite side of the net. 1Start by holding the ball and smacking it to signal the set to a certain hitting area on the court. 2Watch your blockers move to the signaled spot and have them wait to jump. 3Adjust anyone on the court who is not lined up properly for the spike. After a few rounds of getting your players into position, then you can add in some real spiking to this drill. If you have the extra help then have someone toss or set the ball to the coach who will spike the ball from different positions. You can also set up a chair or platform to stand on and lob spikes at your players in this position. It’s excellent practice for the whole team to anticipate a failed block and be ready to dig the ball and ​pass it to their other teammates​​​. Also make sure that your front row players are backing off of the net quickly after it comes over. They need to be ready for backup or to spike the ball. ​Give your players a fun drill for blocking to help with moving together and timing. This drill will also help them achieve getting their hands up and over the net. Make sure that blockers’ hands are open and fingers are spread wide so that you have a big area for contact with the ball. Keep hands strong and don’t let them flop against the ball. You want to provide a sturdy wall for the ball to rebound off of. 1Line up three players in basic position on both sides of the net. 2When you blow the whistle, the two players mirror each other through the net will jump. 3As they jump, the aim is to give the other a double high five without hitting the net. 4After they land, blow the whistle again and players will move to their right across the net and immediately jump to hit hands with the player mirroring them. 5Blow the whistle again and they will continue moving down the line repeating this task. Have extra players standing on the ten foot line ready to enter as the line moves down. Entering players will perform a spiking footwork drill to get to the net, and then continue the blocking footwork as they move down the line. When it comes to successfully blocking, you need to make sure your players have the right footwork to navigate in front of the net. They should know how to anticipate the timing and realize they are blocking the player, not the ball. Incorporating volleyball blocking drills into your daily practice plans will help your front row become better blockers on the net and help them learn to work together as a team.